Rudolph’s bright red nose on Christmas Day to empaths. 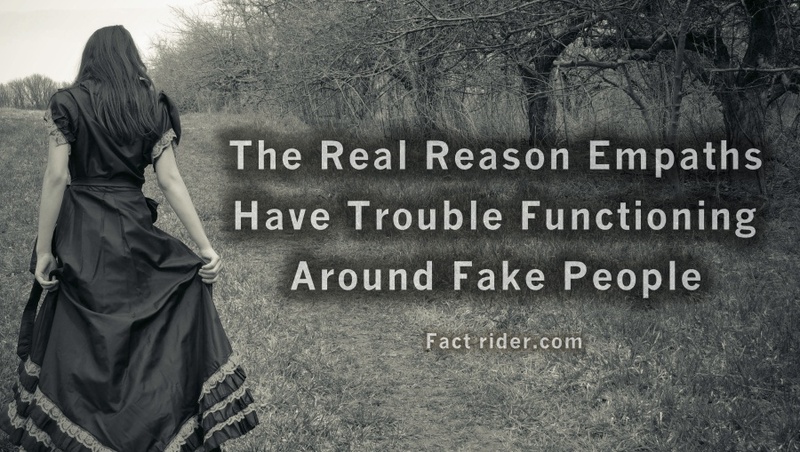 Not only can they read them like a book, but fake people raise a lot of red flags for an empath, so spotting one often sends the empath into a bit of a flustered state of panic. Physical and mental symptoms start popping up all over the place for the empath, like sweaty hands, an increased heart rate, and feelings of fatigue and doom and gloom. While many phony people have good intentions, it is the emotional pain and trauma that they’re trying to hide that empaths pick up on and experience. Those who act overly nice or sacrificial just so they will be accepted by the group and anyone else they meet. People who are naturally angry that feign niceness or friendliness. People who feel insecure and think they have to make up for it by being tough and rigid. A person who behaves in a way that directly contradicts who they are. Someone who exaggerates stories and tales just to appear more interesting. We avoid pushovers simply because of the negative vibrations they put out. Speaking becomes difficult, and certain details about the empath’s life become murky when the fake person asks about them. We feel overwhelmingly uncomfortable until the fake person leaves. We actually become sick when spending prolonged amounts of time with fake people. We experience confusion and feelings of guilt when we’re unable to actually spend time with this person, particularly when we’re fond of them. We just get away from them at all costs.